airways obstruction. This is particularly useful in patients who are unable to use the aerosol form of salbutamol properly or who prefer a powder formulation for inhalation. 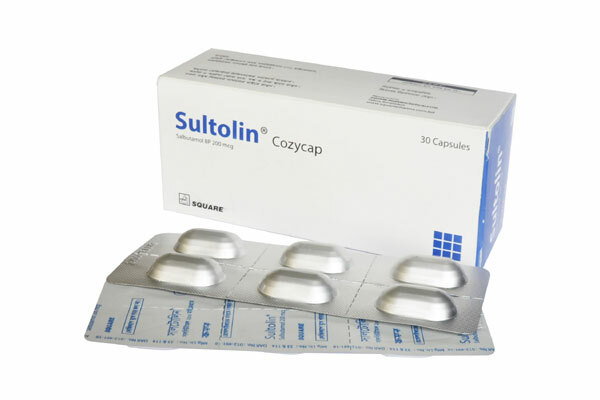 Sultolin® Cozycap acts rapidly and may be used when necessary to relieve attacks of acute dysponea. Children: One Sultolin® Cozycap is the recommended dose for relief of acute bronchospasm in the maintenance of episodic asthma or before exercise of children 4 years of age and older. One inhalation should be administered for three or four times a day for routine maintenance or prophylactic therapy. This dosage may be increased to inhalation of two cozycaps, if necessary. The bronchodilator effect of each administration of inhaled Sultolin® Cozycap lasts for at least four hours. Such patients should be warned not to increase the dose of inhaler, but should seek medical advice immediately. Sultolin® Cozycap: Each pack contains 30 cozycaps in alu-alu blister.